Sentinel-2A, which has been in orbit since June 2105, captured this false-color image of Qingdao, China. 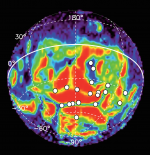 The European Space Agency’s Mars Express satellite has been able to detect ultraviolet auroras on the planet by combining remote observations with in situ measurements of electrons hitting the atmosphere, and a new study looks at 10 years of such observations. Having reached the halfway mark of his latest one-year mission and overall logging a record-breaking time in space approaching 400 days, U.S. astronaut and commander of the current Expedition 45 crew Scott Kelly has been dazzling audiences with beautiful pictures taken from beyond Earth’s atmosphere. He recently photographed the Nile River during a nighttime flyover on Sept. 22, 2015. On Sept. 16, 2015, an 8.3-magnitude earthquake struck the coast of central Chile, triggering tsunami warnings and coastal evacuations. Lasting three minutes, the powerful earthquake occurred along the boundary of the Nazca and South American tectonic plates. This Sentinel-1A radar image features some of the Azore islands about 1,600 kilometers west of Lisbon, including the turtle-shaped Faial, the dagger-like Sao Jorge and Pico Island, with Mount Pico reaching more than 2,351 meters in height. Hurricane Joaquin, the strongest Atlantic hurricane of the 2015 season, is shown in this photograph taken by NASA Astronaut Scott Kelly on Oct. 2, 2015, from the International Space Station. This Sentinel-2A ‘color vision’ image captures part of the Mississippi swamps on the east and west banks of the Mississippi River, south of New Orleans and north of the Mississippi Delta. 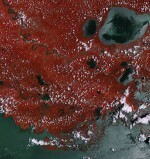 The red color shows vegetation, while gray represents bodies of water. A new image from the NASA/ESA Hubble Space Telescope captures the Twin Jet Nebula’s shells and knots of expanding gas, as two iridescent lobes of material stretch outwards from a central star system. Within these lobes, two huge jets of gas are streaming from the star system at speeds in excess of 1 million kilometers (621,400 miles) per hour. 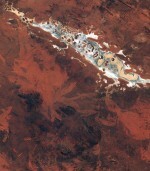 This image captured by Sentinel-2A on July 13, 2015, features Lake Amadeus in Australia’s Northern Territory.